This guide is based on a home lighting use case involving lights in a home that can be remotely controlled by a user's smartphone leveraging the capabilities of oneM2M. An overview of the use case is shown below. The lights are deployed in a home and are attached to a home gateway. 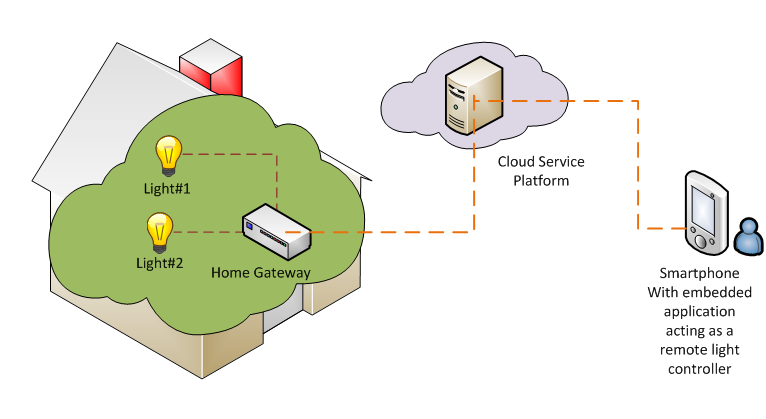 The home gateway communicates with a cloud service platform allowing the lights to be controlled remotely by the smartphone. The cloud service platform supports a set of services to enable the smartphone to more easily control the lights in the home. Some examples of services include registration, discovery, data management, group management, subscription/notification etc. Discovery of lights deployed in the home. Sending commands to change light state i.e. ON and OFF.